Here’s those remarkable labor and delivery videos: Best Food for Late Pregnancy (http://nutritionfacts.org/video/best-food-for-late-pregnancy) and Best Food for Labor and Delivery (http://nutritionfacts.org/video/best-food-for-labor-and-delivery). And here’s some recipes! Date Syrup (https://nutritionfacts.org/recipe/date-syrup/) and a Balsamic Date Glaze (https://nutritionfacts.org/recipe/balsamic-date-glaze/). But what about all the sugar in dates? See: If Fructose is Bad, What About Fruit? (https://nutritionfacts.org/video/if-fructose-is-bad-what-about-fruit/). The other video I referenced to is Stool pH and Colon Cancer (https://nutritionfacts.org/video/stool-ph-and-colon-cancer/). I did a month-long video series on mammograms. What about colonoscopies? See: Should We All Get Colonoscopies Starting at Age 50? (https://nutritionfacts.org/video/should-we-all-get-colonoscopies-starting-at-age-50). Have a question about this video? Leave it in the comment section at http://nutritionfacts.org/video/benefit-of-dates-for-colon-health and someone on the NutritionFacts.org team will try to answer it. Want to get a list of links to all the scientific sources used in this video? 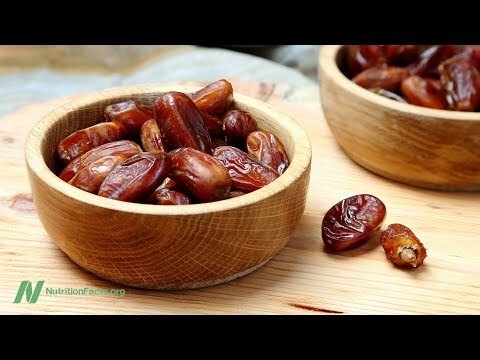 Click on Sources Cited at http://nutritionfacts.org/video/benefit-of-dates-for-colon-health. You’ll also find a transcript and acknowledgments for the video, my blog and speaking tour schedule, and an easy way to search (by translated language even) through our videos spanning more than 2,000 health topics.